It all began over thirty years ago in the small Alabama town of Jasper with a family-owned steakhouse and homegrown good flavor. There, Moore’s Original Marinade was created and soon became a staple in the town for its delightful, hickory taste. From the start, the flavor defined not only food, but family. This recipe was the Moore’s family’s shining achievement and was so sought after, that they eventually began to sell it in Styrofoam cups to the steakhouse regulars. Since then, they’ve upgraded from Styrofoam cups and expanded their taste buds, bringing you and yours mouthwatering favorites like the award winning Moore’s Buffalo Wing Sauce. Moore's is always working to capture the magic of the first spark of flavor that started it all three decades ago. They pour their hearts into their marinades and sauces in order to give you a taste of true southern flavor to share with those closest to you. Moore’s provides Moore Flavor for any cooking occasion! 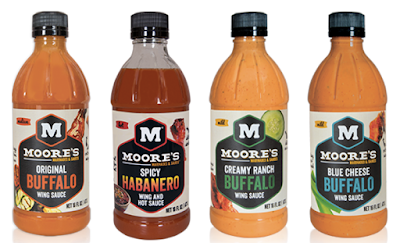 Check it all out at Moore's Marinades on Facebook, as well as Moore's Marinades on Twitter.